For more than 50 years, oral vitamin K antagonists (VKAs) were the choice of anticoagulant for the long-term treatment and prevention of arterial and venous thromboembolic events (VTE). VKA treatment is safe and effective, if a high time in therapeutic range is achieved. However, achieving a stable, therapeutic international normalised ratio can prove challenging in the context of drug and food interactions and liver disease, resulting in either an increased risk of thromboembolism due to undertreatment or bleeding due to overtreatment. In recent years, four direct oral anticoagulants (DOACs), dabigatran, rivaroxaban, apixaban and edoxaban, have been compared with warfarin for stroke prevention in AF, in large, phase 3, randomised, controlled trials (RCTs). Various terms have been used to describe these drugs, including new/ novel oral anticoagulants or non-vitamin K oral anticoagulants. The International Society on Thrombosis and Haemostasis recommends using the term ‘DOAC’.1 These anticoagulants directly inhibit specific proteins within the coagulation cascade; in contrast, VKAs inhibit the synthesis of vitamin K-dependent clotting factors. Dabigatran, a direct thrombin inhibitor, and rivaroxaban, apixaban and edoxaban, the factor Xa inhibitors, produce a more predictable, less labile anticoagulant effect; they have been shown to be at least as safe and effective as warfarin in stroke prevention in AF. As the availability of DOACs has expanded anticoagulant treatment options, it is important that clinicians familiarise themselves with these novel agents. They are licensed for use in stroke prevention in non-valvular AF, the treatment of VTE and as thromboprophylaxis following major orthopaedic surgery. Rivaroxaban has also been approved in Europe for the prevention of atherothrombotic events following acute coronary syndrome (ACS). The purpose of the present article was to summarise the available trial data and provide useful clinical guidance on the different DOACs for stroke prevention in non-valvular AF. In the phase 3 clinical trials, many patient subgroups were excluded or underrepresented. In contrast to the RCTs, patients in the real world demonstrate heterogeneity with a greater variation in stroke risk, renal impairment, liver disease and other conditions associated with an increased risk of bleeding. Real-world data are therefore needed to assess whether the efficacy and safety of DOACs achieved in patients with non-valvular AF in RCTs translate into routine clinical practice. In the Randomized Evaluation of Long Term Anticoagulant Therapy With Dabigatran (RE-LY) study, both doses of dabigatran (110 mg twice daily and 150 mg twice daily) were shown to be non-inferior to warfarin in preventing stroke and systemic embolism (p<0.001 in both arms), with the higher dose also being superior to warfarin (p<0.001).3 Interestingly, the rates of haemorrhagic stroke were significantly lower in both dabigatran arms (p<0.001), as well as rates of life-threatening bleeding (low dose: p<0.001, high dose: p=0.04) and intracranial bleeding (ICH) (p<0.001 in both arms). However, the rate of gastrointestinal (GI) bleeding was significantly higher in the higher-dose dabigatran arm (p<0.001). The results of a systematic review and meta-analysis of 348,750 patients on dabigatran in real-world clinical practice were similar, with higher GI bleeding rates compared to warfarin (p=0.041), but a lower rate of ICH (p<0.001).4 In the RE-LY study, there was a non-significant increase in myocardial infarction (MI) with dabigatran compared with warfarin. This has not been reproduced in the real-world data, with a US Food and Drug Administration study of 134,000 Medicare patients5 and a multicentre registry of 555 patients6 showing no difference in the rates of MI. In an efficacy and safety study of Rivaroxaban With Warfarin for the Prevention of Stroke and Non-Central Nervous System Systemic Embolism in Patients With Non-Valvular Atrial Fibrillation (ROCKET-AF) trial, rivaroxaban was shown to be non-inferior to warfarin in preventing stroke and systemic embolism (p<0.001);7 the rates of ICH and fatal bleeding were significantly lower in those treated with rivaroxaban (p=0.02 and p=0.003, respectively). However, there was a significant increase in major GI bleeding in the rivaroxaban arm (p<0.001), although there was no difference in all-cause mortality. In the real-world observational Xarelto for Prevention of Stroke in Patients With Atrial Fibrillation (XANTUS) study, both lower thrombotic and bleeding rates were reported compared with the ROCKET-AF trial, including a lower rate of GI bleeding (0.9 versus two events/100 patient years, respectively).8 In the XANTUS study, patients had a mean CHADS2 score of 2 compared to 3.5 in the ROCKET-AF study, which could explain the discrepancy in the rates of thrombotic complications. Both doses of edoxaban (30 mg once daily and 60 mg once daily) were shown to be non-inferior to warfarin (p=0.005 and p<0.001) and superior in the case of the higher dose (p=0.02) in preventing stroke and systemic embolism in the Effective Anticoagulation with Factor XA Next Generation in Atrial Fibrillation – Thrombolysis In Myocardial Infarction 48 (ENGAGE AF-TIMI) 48 trial.11 However, edoxaban at the lower dose of 30 mg has been shown to be inferior to warfarin in preventing ischaemic stroke (p<0.001). There was an increase in the rate of stroke in edoxaban patients with a creatinine clearance of >95 ml/min, although this was not statistically significant (p=0.08).12Both doses were associated with lower rates of bleeding, including ICH and major and life-threatening bleeding (p<0.001 for all). The only exception was the higher dose, which was associated with a higher rate of GI bleeding (p=0.03). A meta-analysis of the four phase 3 clinical trials was performed to assess the safety and efficacy of DOACs in patients with AF and heart failure (HF).13 A total of 26,384 (48 %) of the 55,011 patients enrolled in the four trials had a diagnosis of HF (defined according to individual trial definitions). There were similar rates of stroke and systemic embolism (p=0.68) and major bleeding (p=0.21) in HF and no-HF patients. Those with HF had reduced rates of total bleeding (p<0.01) and ICH (p<0.01), but a higher rate of all-cause death (p<0.01) and cardiovascular death (p<0.01) compared to no-HF patients treated with DOACs (this finding did not appear to be affected by the choice of oral anticoagulant). The rates of stroke and systemic embolism, major bleeding and ICH were significantly reduced in those treated with DOACs compared with warfarin, regardless of the presence or absence of HF (p>0.05 for each interaction). These findings suggest that DOACs are safe and efficacious in patients with AF, regardless of whether they have HF or not. At present, rivaroxaban is the only DOAC licensed for use in ACS. Data from the Anti-Xa Therapy to Lower Cardiovascular Events in Addition to Standard Therapy in Subjects With Acute Coronary Syndrome ACS 2–Thrombolysis In Myocardial Infarction 51 (ATLAS ACS 2-TIMI 51) trial showed that rivaroxaban at either 2.5 mg twice daily or 5 mg twice daily, in addition to either aspirin or dual antiplatelet therapy (DAPT), significantly reduced the rate of death from cardiovascular causes, compared to the placebo (p=0.008).14 Although there was a higher rate of major bleeding with rivaroxaban (p<0.001), there was no statistically-significant difference in fatal bleeding between rivaroxaban and placebo. Subgroup analysis revealed that major or minor bleeding and fatal bleeding rates were lower in the rivaroxaban 2.5 mg twice daily arm compared to the 5 mg twice daily arm (p=0.021 and p=0.044), but with no significant difference in death from cardiovascular causes. An additional subgroup analysis, evaluating patients who had undergone percutaenous coronary intervention (PCI) as part of the index event or previous stent insertion, demonstrated a reduction in stent thrombosis (p=0.023) and mortality (p=0.039) with the use of rivaroxaban 2.5 mg twice daily, in addition to DAPT, compared to placebo and DAPT. In the Open-label, Randomized, Controlled, Multicenter Study Exploring Two Treatment Strategies of Rivaroxaban and a Dose-Adjusted Oral Vitamin K Antagonist Treatment Strategy in Subjects With AF Who Undergo PCI (PIONEER AF-PCI) trial, patients with non-valvular AF undergoing PCI and stent placement were randomised to receive either low-dose rivaroxaban (15 mg once daily) plus a P2Y12 inhibitor for 12 months, very low-dose rivaroxaban (2.5 mg twice daily) plus DAPT for 1, 6 or 12 months or standard therapy with a VKA and DAPT for 1, 6 or 12 months.15 Death rates from cardiovascular causes, MI and stroke were similar in the three groups (although the similar efficacies should be interpreted with caution, due to broad confidence intervals), but clinically-significant bleeding rates were lower in both rivaroxaban groups (p<0.001 for both doses). These data suggest that rivaroxaban, in addition to either a P2Y12 inhibitor or DAPT, is safer in terms of bleeding risk in patients with AF undergoing PCI than warfarin. The other DOACs are currently being evaluated for their role in PCI. The results of the Evaluation of Dual Therapy With Dabigatran vs. Triple Therapy With Warfarin in Patients With AF That Undergo a PCI With Stenting (RE-DUAL-PCI),16 Apixaban Versus Warfarin in Patients with AF and acute coronary syndrome or PCI (AUGUSTUS) (apixaban)17 and Edoxaban Treatment Versus Vitamin K Antagonist in Patients With AF an Undergoing PCI (ENTRUST AF-PCI; edoxaban) trials18 are awaited. In comparison to conventional treatment with VKAs, DOACs offer many treatment advantages, including fixed dosing, fewer drug and dietary interactions, rapid onset and short half-lives, which can preclude the need for peri-procedural bridging, as well as no monitoring requirement. It is also important to be aware of potential disadvantages: there is no specific reversal agent (with the exception of idarucizumab for dabigatran), there is a need for avoidance or dose reduction in renal impairment and the short half-lives necessitate strict adherence. It is therefore important to take into account patient-specific factors in order to tailor anticoagulant treatment to the individual. Creatinine clearance should be calculated using the Cockcroft– Gault equation prior to commencing a DOAC. Renal clearance of dabigatran accounts for 85 % of total clearance, and it is therefore contraindicated in those with a creatinine clearance of <30 ml/min. A study by Chan et al. showed that the risk of hospitalisation or death from bleeding was higher in dialysis patients taking dabigatran and rivaroxaban compared with warfarin (p=0.0001 and p=0.04).19 Dose reductions of rivaroxaban, apixaban and edoxaban could be required, depending on the creatinine clearance, but these drugs are not contraindicated unless creatinine clearance is <15 ml/min. A systematic review and meta-analysis of nine RCTs including 54,667 patients with renal impairment showed a significantly reduced risk of major bleeding in those taking DOACs, with a creatinine clearance of 50–80 ml/min (risk ratio: 0.87 [95 % confidence interval: 0.81–0.93]), and a non-significant decrease in those with a creatinine clearance of <50 ml/min (risk ratio: 0.83 [95 % confidence interval: 0.68–1.02]), compared to warfarin.20 Apixaban was associated with a decreased rate of major bleeding compared with other DOACs in patients with a creatinine clearance of <50 ml/min. A retrospective matchedcohort study assessed the safety and efficacy of apixaban versus warfarin in patients with a creatinine clearance of <25 ml/min, serum creatinine concentration of >2.5 mg/dl or on dialysis.21 There was a non-significant decrease in major bleeding in those who received apixaban compared with warfarin (9.6 % versus 17.8 %, p=0.149), and a similar occurrence of stroke between the two groups (7.5 % in both). Further studies are needed to establish whether apixaban is safe and effective in those with a creatinine clearance of <15 ml/min. Obamiro et al. assessed patients’ anticoagulation knowledge, and showed that patients taking DOACs were less likely to view missing a dose as a problem, compared to those taking warfarin (p<0.05).22 Unlike warfarin, DOACs have a rapid onset and offset of anticoagulant activity, and therefore, 1 day without the drug will render the patient unanticoagulated. Patients should therefore be counselled about the risk of missing a dose of a DOAC. If there are concerns regarding non-adherence, warfarin, due to its long half-life, should be considered. Dabigatran has been shown to cross the placenta.23 Animal studies have demonstrated pregnancy loss and foetal harm with both dabigatran and rivaroxaban.24,25 It is unknown whether they are secreted in breast milk. Data regarding edoxaban and apixaban are limited. DOACs should therefore be avoided in pregnancy and breastfeeding. Patients with cancer were excluded from the AF trials, and so there are limited data regarding the use of DOACs in cancer patients with AF. Therefore, further studies are needed to establish their role in this situation. However, in the VTE trials, preliminary evidence suggests that DOACs were safe and efficacious in cancer patients who subsequently developed AF. Furthermore, an observational study on cancer patients with AF showed that bleeding rates were similar or lower in those taking DOACs compared to warfarin.35 Although there was no difference in the risk of ischaemic stroke, DOACs were superior to warfarin in lowering the risk of incident VTE. Although drug interactions are less frequent than with warfarin, it is important to be aware of which drugs interfere with DOAC metabolism. The hepatic enzyme CYP3A4 is important in the metabolism of rivaroxaban and apixaban, and all DOACs are substrates of the P-glycoprotein transporter system. Enzyme inducers can cause a reduction in DOAC plasma concentration, and could therefore increase the risk of thromboembolic events, while inhibitors potentiate the DOAC concentration, which could result in bleeding. The important drug interactions are highlighted in Table 1. Because DOACs have a predictable anticoagulant effect and are administered at a fixed dose, they do not require routine monitoring. The timing of stopping a DOAC prior to an invasive procedure or operation depends on the half-life of the drug, creatinine clearance and the risk of bleeding (Table 3). Invasive procedures associated with a very low risk of bleeding, such as dentistry, joint injections, cataract surgery and pacemaker insertion, might not require interruption of anticoagulation, whereas high-risk procedures, such as spinal anaesthesia, coronary artery bypass, heart valve surgery and neurosurgery, will require discontinuation of the DOAC at least 48 hours before. Anticoagulation can be recommenced at 6–12 hours following low-risk procedures if haemostasis has been achieved, and at 48 hours following high-risk procedures. With the exception of dabigatran, there is currently no licensed reversal agent for DOACs. Andexanet alfa has been shown to rapidly reverse the antifactor Xa activity in those with acute major bleeding associated with rivaroxaban or apixaban,39 but is not yet available in clinical practice. It is a recombinant modified human factor Xa decoy protein that is catalytically inactive due to the substitution of the active-site serine with alanine. It lacks the gamma-carboxyglutamic acid domain, preventing it from binding to phospholipid membranes, but retains the ability to bind to factor Xa inhibitors with a high affinity. Ciraparantag (aripazine) is a broad-spectrum reversal agent that binds to the oral factor Xa and direct thombin inhibitors, unfractionated heparin and LMWH, and is currently being evaluated in phase 2 clinical trials. If the patient is taking an oral factor Xa inhibitor and is unresponsive to general haemostatic measures, prothrombin complex concentrate (PCC) at a dose of 25–50 units/kg should be considered. Idarucizumab, a monoclonal antibody, binds free and thrombin-bound dabigatran, thereby preventing it from exerting its anticoagulant effect, and is now licensed for use. The recommended dose is 5 g, given intravenously when rapid reversal is required in those who need emergency surgery or those with uncontrolled bleeding. 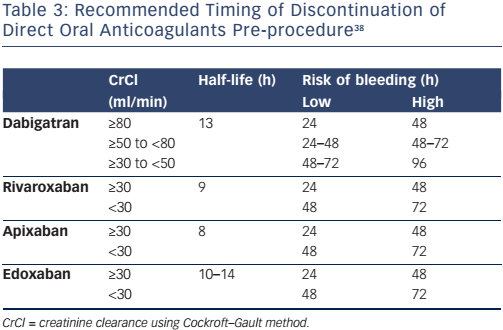 A second dose might be considered if bleeding recurs or if there is a potential for life-threatening rebleeding in association with prolonged clotting times. mechanical compression or surgical or radiological intervention to identify and treat the source of bleeding. consider intravenous tranexamic acid and seek advice from a haematologist regarding the administration of PCC, or idarucizumab if the patient has taken dabigatran. Large, phase 3 clinical trials have shown that DOACs are at least as safe and effective as VKAs in the prevention of stroke in non-valvular AF. Real-world data have allowed us to determine the efficacy and safety of these drugs in everyday clinical practice, outside the confines of RCTs, and thus far, have shown similar outcomes, with reduced rates of major bleeding, including ICH and increased or similar rates of GI bleeding. Betrixaban, an oral factor Xa inhibitor, has shown promise in extended VTE prophylaxis41 and stroke prevention42 in those hospitalised with an acute medical illness. Due to its distinct pharmacokinetic profile with minimal renal clearance and a long half-life, this might overcome some of the limitations of the other DOACs in clinical practice. The availability of andexanet alfa and ciraparantag will address the unmet need for reversal agents in the management of DOAC-associated major and life-threatening bleeding. DOACs have many advantages over VKAs, including a rapid onset and offset of anticoagulant effect, fixed dosing, fewer drug and dietary interactions and no monitoring requirement; these make attractive options for anticoagulation. As there are several agents available, it is important that clinicians are familiar with the efficacy and safety profiles of DOACs, based on both the trial and real-world data, to counsel and tailor treatment to the individual patient. James Uprichard, The Centre for Haemostasis and Thrombosis, Department of Haematology, St George’s Hospital, Blackshaw Road, SW17 0QT London, UK. Barnes GD, Ageno W, Ansell J, Kaatz S. Recommendation on the nomenclature for oral anticoagulants: communications from the SSC of the ISTH: reply. J Thromb Haemost 2015;13(11):2132–3. Eikelboom JW, Connolly SJ, Brueckmann M, et al. Dabigatran versus warfarin in patients with mechanical heart valves. N Engl J Med 2013;369(13):1206–14. Connolly SJ, Ezekowitz MD, Yusuf S, et al. Dabigatran versus warfarin in patients with atrial fibrillation. N Engl J Med 2009;361 (12):1139–51. Romanelli RJ, Nolting L, Dolginsky M, et al. Dabigatran versus warfarin for atrial fibrillation in real-world clinical practice: a systematic review and meta-analysis. Circ Cardiovasc Qual Outcomes 2016;9(2):126–34. Graham DJ, Reichman ME, Wernecke M, et al. Cardiovascular, bleeding, and mortality risks in elderly Medicare patients treated with dabigatran or warfarin for nonvalvular atrial fibrillation. Circulation 2015;131 (2):157–64. Yavuz B, Ayturk M, Ozkan S, et al. A real world data of dabigatran etexilate: multicenter registry of oral anticoagulants in nonvalvular atrial fibrillation. J Thromb Thrombolysis 2016;42(3):399–404. Patel MR, Mahaffey KW, Garg J, et al. Rivaroxaban versus warfarin in nonvalvular atrial fibrillation. N Engl J Med 2011;365(10):883–91. Camm AJ, Amarenco P, Haas S, et al. XANTUS: a real-world, prospective, observational study of patients treated with rivaroxaban for stroke prevention in atrial fibrillation. Eur Heart J 2016;37(14):1145–53. Granger CB, Alexander JH, McMurray JJ, et al. Apixaban versus warfarin in patients with atrial fibrillation. N Engl J Med 2011;365(11):981–92. Yao X, Abraham NS, Sangaralingham LR, et al. Effectiveness and safety of dabigatran, rivaroxaban, and apixaban versus warfarin in nonvalvular atrial fibrillation. J Am Heart Assoc 2016;5(6): pii: e003725. Giugliano RP, Ruff CT, Braunwald E, et al. Edoxaban versus warfarin in patients with atrial fibrillation. N Engl J Med 2013;369(22):2093–104. Bohula EA, Giugliano RP, Ruff CT, et al. Impact of renal function on outcomes with edoxaban in the ENGAGE AF-TIMI 48 trial. Circulation 2016;134(1):24–36. Savarese G, Giugliano RP, Rosano GM, et al. Efficacy and safety of novel oral anticoagulants in patients with atrial fibrillation and heart failure: a meta-analysis. JACC Heart Fail 2016;4(11):870–80. Mega JL, Braunwald E, Wiviott SD, et al. Rivaroxaban in patients with a recent acute coronary syndrome. N Engl J Med 2012;366(1):9–19. Gibson CM, Mehran R, Bode C, et al. Prevention of bleeding in patients with atrial fibrillation undergoing PCI. N Engl J Med 2016;375(25):2423–34. ClinicalTrials.gov. Evaluation of dual therapy with dabigatran vs. triple therapy with warfarin in patients with AF that undergo a PCI with stenting (REDUAL-PCI). 2017. Available at: https://clinicaltrials.gov/ct2/show/NCT02164864 (accessed on 5 May 2017). ClinicalTrials.gov. An open-label, 2 x 2 factorial, randomized controlled, clinical trial to evaluate the safety of apixaban vs. vitamin k antagonist and aspirin vs. aspirin placebo in patients with atrial fibrillation and acute coronary syndrome or percutaneous coronary intervention (AUGUSTUS). 2017. Available at: https://clinicaltrials.gov/ct2/show/NCT02415400 (accessed on 5 May 2017). ClinicalTrials.gov. Edoxaban treatment versus vitamin k antagonist in patients with atrial fibrillation undergoing percutaneous coronary intervention (ENTRUST-AF-PCI). 2017. Available at: https://clinicaltrials.gov/ct2/show/NCT02866175 (accessed on 5 May 2017). Chan KE, Edelman ER, Wenger JB, et al. Dabigatran and rivaroxaban use in atrial fibrillation patients on dialysis. Circulation 2015;131 (11):972–9. Raccah BH, Perlman A, Danenberg HD, et al. Major bleeding and hemorrhagic stroke with direct oral anticoagulants in patients with renal failure: systematic review and metaanalysis of randomized trials. Chest 2016;149(6):1516–24. Stanton BE, Barasch NS, Tellor KB. Comparison of the safety and effectiveness of apixaban versus warfarin in patients with severe renal impairment. Pharmacotherapy 2017;37(4):412–9. Obamiro KO, Chalmers L, Bereznicki LR. Development and validation of an oral anticoagulation knowledge tool (AKT). PLoS One 2016;11 (6): e0158071. Bapat P, Kedar R, Lubetsky A, et al. Transfer of dabigatran and dabigatran etexilate mesylate across the dually perfused human placenta. Obstet Gynecol 2013;123(6):1256–61. Boehringer Ingelheim Canada. Pradaxa product monograph. 2016. Available at: https://www.boehringeringelheim.ca/sites/ca/files/documents/pradaxapmen.pdf (accessed 29 April 2017). Larsen TB, Nielsen PB, Skjoth F, et al. Non-vitamin antagonist oral anticoagulants and the treatment of venous thromboembolism in cancer patients: a semi-systematic review and meta-analysis of safety and efficacy outcomes. PLoS One 2014;9(12):e114445. Vedovati MC, Germini F, Agnelli G, Becattini C. Direct oral anticoagulants in patients with venous thromboembolism and cancer: a systematic review and meta-analysis. Chest 2015;147(2):475–83. van der Hulle T, den Exter PL, Kooiman J, et al. Meta-analysis of the efficacy and safety of new oral anticoagulants in patients with cancer-associated acute venous thromboembolism. J Thromb Haemost 2014;12(7):1116–20. Sardar P, Chatterjee S, Herzog E, et al. New oral anticoagulants in patients with cancer: current state of evidence. Am J Ther 2015;22(6):460–8. Young A, Phillips J, Hancocks H, et al. OC-11 – anticoagulation therapy in selected cancer patients at risk of recurrence of venous thromboembolism. Thromb Res. 2016;140 Suppl 1:S172–3. ClinicalTrials.gov. Apixaban for the Treatment of Venous Thromboembolism in Patients with Cancer (CARAVAGGIO). 2017. Available at: https://clinicaltrials.gov/ct2/show/ NCT03045406 (accessed 5 May 2017). ClinicalTrials.gov. Cancer venous thromboembolism (VTE) – Hokusai VTE-Cancer. 2016. Available at: https:// clinicaltrials.gov/ct2/show/NCT02073682 (accessed 5 May 2017). ClinicalTrials.gov. Direct oral anticoagulants (DOACs) versus LMWH +/– Warfarin for VTE in Cancer (CANVAS). 2017. Available at: https://clinicaltrials.gov/ct2/show/NCT02744092 (accessed 5 May 2017). Short NJ, Connors JM. New oral anticoagulants and the cancer patient. Oncologist 2014;19(1):82–93. Shah S, Datta YH, Norby F, et al. Direct oral anticoagulants in patients with cancer. Blood 2016;128:877. Kitchen S, Gray E, Mackie I, et al. Measurement of noncoumarin anticoagulants and their effects on tests of Haemostasis: guidance from the British Committee for Standards in Haematology. Br J Haematol 2014;166(6):830–41. Cuker A, Siegal DM, Crowther MA, et al. Laboratory measurement of the anticoagulant activity of the non-vitamin K oral anticoagulants. J Am Coll Cardiol 2014;64(11):1128–39. Keeling D, Tait RC, Watson H, British Committee of Standards for Haematology. Peri-operative management of anticoagulation and antiplatelet therapy. Br J Haematol 2016;175(4):602–13. Connolly SJ, Milling TJ Jr, Eikelboom JW, et al. Andexanet alfa for acute major bleeding associated with factor Xa inhibitors. N Engl J Med 2016;375(12):1131–41. Ruff CT, Giugliano RP, Antman EM. Management of bleeding with non-vitamin K antagonist oral anticoagulants in the era of specific reversal agents. Circulation 2016;134(3):248–61. Cohen AT, Harrington RA, Goldhaber SZ, et al. Extended thromboprophylaxis with betrixaban in acutely ill medical patients. N Engl J Med 2016;375(6):534–44. Gibson CM, Chi G, Halaby R, et al. Extended-duration betrixaban reduces the risk of stroke versus standarddose enoxaparin among hospitalized medically ill patients: an APEX trial substudy (Acute Medically Ill Venous Thromboembolism Prevention With Extended Duration Betrixaban). Circulation 2017;135(7):648–55. Citation: Sikorska J, Uprichard J. Direct Oral Anticoagulants: A Quick Guide. European Cardiology Review 2017;12(1):40–5.